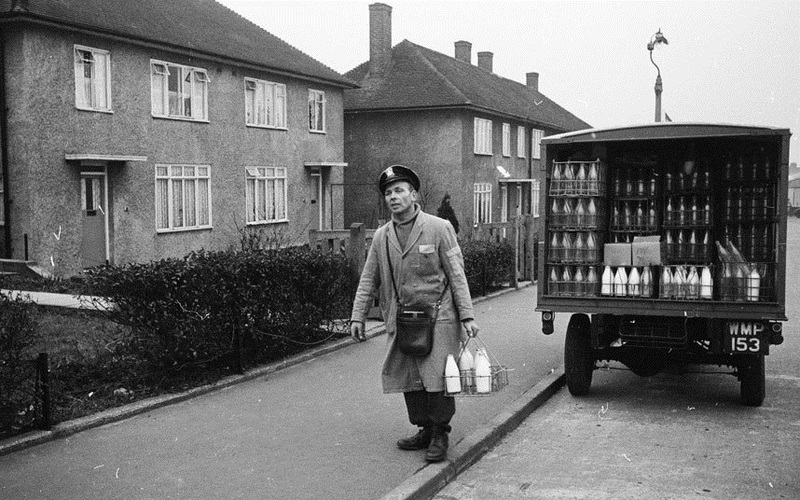 Could the milkman be making a comeback? We’ve all probably heard an idyllic story or two about the milkman who used to deliver farm fresh milk to household doorsteps at sunrise and cart away the empty bottles to wash and reuse. Why doesn’t he or she come around anymore? In 1947, 86% of US beer came in refillable bottles. Refillable beverage containers were a common phenomenon until the mid-20th century—in 1947, 100 percent of soft drinks came in refillable glass bottles. By the 1990s, such bottles had almost vanished, and in 2012, the last US Coca-Cola bottling plant to use refillable bottles topped off its last Coke. It’s a similar story for beer: in 1947, 86 percent of US beer came in refillable bottles. Today, finding beer in single-serve refillable bottles in the United States is nearly impossible. So why have refillables all but disappeared? For one thing, efficient refill systems typically require bottles to be interchangeable between companies, but beverage producers often want total control of their bottles to increase brand recognition. Another issue is weight: glass, the most common material for refillable containers, is heavy, so it costs more to transport than plastic or aluminum. Despite these hurdles, refillable bottles may be making a comeback in Cascadia. Here are seven beverages you can now find in refillable containers across the region. Far and away the best example of refillable beverage containers in action in Cascadia is British Columbia’s refill system for domestic beer bottles. The Brewers Association of Canada reports a 96 percent return rate on domestic glass beer bottles. Bottlers clean, refill, and put a typical bottle back on the store shelf within three days of return. They refill a bottle 15 times, on average, before it’s worn out and ready to recycle. Sadly, no beer refill system anywhere in the United States can hold a candle to British Columbia’s. According to the US Beer Institute, the last beer sold in refillable single-serve bottles was in 2006, though there is at least one Oregon brewery that is bucking this trend (more on them below). Growlers are becoming the container of choice for craft beer enthusiasts and also a creative answer to the problem of beverage packaging waste. Growlers are reusable jugs typically made of brown glass, though some are ceramic or metal. They usually cost $5 to $10. After emptying them, consumers wash their own growlers and bring them back for reduced-price refills. Beer growler refill stations are popping up across British Columbia, Oregon, and Washington. In Portland, one growler map lists nearly 50 dedicated filling establishments, and in Seattle, you can even fill your growler at some Bartell Drugs. One popular growler filling chain, Growler Guys (pictured left), will refill any container you bring to one of its seven locations in Oregon or three in Washington. The stores offer more than 40 beers on tap and handle over 250,000 transactions a year. No one tracks the beer growler market closely, but it remains a modest niche. The industry counts sales of beer in growlers as part of total draft sales, which in 2013 accounted for just 10 percent of total US beer sales. Obviously, plenty of room to grow. Though growlers are the most common way to cut down on packaging waste associated with beer in the United States, there is at least one brewery in Oregon that is taking on the packaging challenge itself. 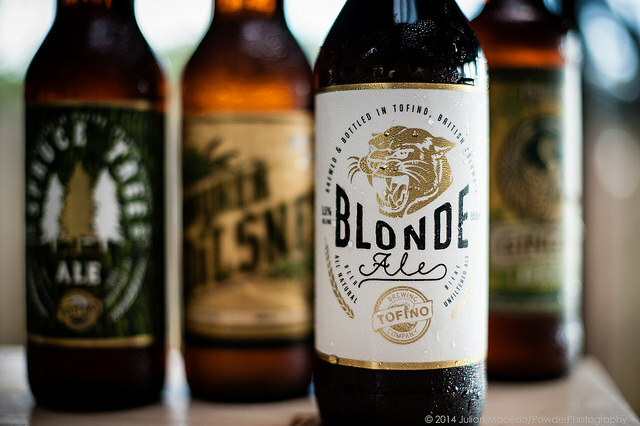 Double Mountain Brewery, based in Hood River, sells its beer in refillable bottles. The brewery collects and sends its returned bottles to a washer in British Columbia. It isn’t all roses, though. Despite offering a $0.10 return per bottle—double the refund given for glass bottles returned for recycling under Oregon’s bottle bill—Double Mountain’s owner Matt Swihart estimates the company receives only 15 to 20 percent of its bottles back. Though grocery stores can also serve as collection points and return the bottles to the Double Mountain distributor, many, including Safeway, have refused to do so because of the additional time and storage required. It’s typically easier to simply crush the bottles for recycling. The problem has forced Double Mountain to get creative, hosting “Bottle Roundup” parties to encourage customers to return their bottles directly to the brewery and offering return punch cards that count towards discounted beverages. Glass can account for as much as 65 percent of a winery’s carbon footprint, yet only three US states allow reusable wine containers. To Cascadia’s credit, Oregon and Washington are two of them. (Texas is the third.) British Columbia, which leads on refillable beer, lags on wine: it bans new wine in old bottles. In Oregon, you can bring any container, up to two gallons in size, to any place wine is sold on tap and fill ‘er up, thanks to legislation adopted in 2013. That’s a big step for Oregon’s 450 wineries. In Washington, the rules are slightly more restrictive. Washington bans sales of wine to patrons with their own jugs at pubs, restaurants, and grocery stores, but as of 2014 the Evergreen State allows sales to customers with their own containers at wineries and their tasting rooms. Lost River Winery, in Winthrop, Washington, is one vintner that has taken advantage of the new legislation and has begun selling its wine in a refillable bottle (pictured). Oregon and Washington also both recently passed legislation, in 2013 and 2014 respectively, allowing for the sale of cider in growlers at establishments that sell beer on tap. That change was a big victory for the area’s growing local cider scene. Oregon saw a nearly 40 percent increase in its cider production between 2013 and 2014 (though not all of that increase was due to the change in growler regulations). Washington’s more recent regulatory changes also promise growth to the state’s more than 30 cideries. Kombucha is a fermented tea gaining in popularity that promises a range of health benefits. Its on-tap presence is growing rapidly to meet the demand of customers eager to use their own containers and cut packaging waste. Kombucha lovers can now fill their growlers or other jugs at many health food stores and bars in British Columbia, Oregon, and Washington. Several Portland Whole Foods locations even offer kombucha on tap. Portland kombucha brewing company Lion Heart Kombucha (pictured) has its beverage on tap at several locations in the region, with flavors ranging from Blueberry Ginger to Lavender Bliss. Several Cascadian dairies collect, clean, and reuse their glass milk jugs, including Oregon’s Garry’s Meadow and Lady Lane Farm and Washington’s Twin Brook Creamery. You can buy their products directly at the dairy or at some grocery stores that also accept the returned bottles. Avalon Dairy in Burnaby, British Columbia, still sells its milk in reusable glass jugs (pictured), and even offers home delivery to many locations around the Lower Mainland. Bottles each come with a $1 deposit fee, reimbursed to the customer when they are returned. Milk in refillable containers is otherwise an anomaly. The story of Oregon’s Lochmead Dairy illustrates dairies’ struggle to stay refillable. Lochmead was a holdout of the refillable bottle, selling about a quarter of its milk in refillable plastic jugs at its 45 retail locations around the state. But in 2011, it had to quit refillables as the containers became too difficult and expensive to come by. With so few other producers demanding the refillable plastic jugs and foil lids, Lochmead’s packaging suppliers stopped making them. No list of refillable beverage containers would be complete without the water bottle. Sales of water in disposable plastic bottles in the United States have soared in the last four decades, increasing more than 2,000 percent from 1976, when the typical American drank just 1.6 gallons of bottled water annually, to 2014, when that number surpassed 34 gallons per capita. Thirty-four gallons per capita means 1,500 water bottles are thrown away every second in the United States. The figures are lower in Canada; in 2013, Canadians each drank an average of nearly 18 gallons of bottled water. In 1976, the typical American drank just 1.6 gal/yr of bottled water. In 2014, 34 gal/yr! The widespread consumption of disposable water bottles is one trend Cascadia has yet to buck. Estimates from 2011 suggest that disposable bottled water usage in Oregon alone is between 128 and 182 million gallons annually; at about 40 gallons per person, that’s even higher than the national average. The environmental impacts of this disposable packaging are unpleasant to confront. Producing one year’s worth of US disposable water bottles consumes 17 million barrels of oil—enough to fuel 1.3 million cars for a year. One answer to this problem is usually no farther away than the kitchen sink. Just about anyone can fill a glass or refillable water bottle at the nearest tap for (very nearly) free, and Cascadia boasts some of the purest water in the world. According to the Ban the Bottle campaign, colleges and universities often consume more single-use water bottles than most other organizations. But some of these institutions are leading the charge to reduce disposable bottle usage. At least 14 colleges and universities in the region have banned plastic water bottles from campus, including Seattle University, University of Portland, Vancouver Island University, and Western Washington University, which in 2014 became the largest public college in the country to institute such a ban. Love this article? Check out our photo essay full of readers' second-hand treasures. To encourage refillable water bottles as a replacement, many of these universities have installed water bottle refill stations around campus. These stations fill water bottles quickly and keep tabs on the number of disposable bottles saved. Over four-and-a-half million tons of America’s municipal solid waste comes from beverage packaging. And what refillable options we do have remain the exception, as they can be expensive and hard to access. But the above list is in no way complete: growler-ready sangria, root beer, mead, and soda are also sold in the region. And as consumers and producers alike both make individual choices and also advocate for policy changes around refillables, we could soon see a Cascadia where reuse moves from a novelty to everyday life. So no, the milk(wo)men may not be making a comeback, but perhaps, moving forward, a culture of reuse will again become a part of how we buy our bevvies. What refillable beverage container spot do you love? Add it to the comments below! If you’re ever driving on the I-5 past Eugene, OR, you can get a Kombucha on tap at SeQuential Biofuels. A great gas station treat! Great article Margaret! You’ve got me wanting to refill my growler now. I love Twin Brook Creamery. And Eat Local right by Sightline’s Seattle office on Union Street advertises kombucha on tap. Thank you for including options throughout OR, WA and BC. Seattle booch insider tip: check out the kombucha stand at the Ballard farmers market where you can swap out your growlers every week. Also, I have heard many a grumblings regarding the low return rates of reusable containers – an issue for many farmers running CSA programs, dairy farmers delivering milk, etc. High participation levels help companies and farms elect to keep this method up and running! On the sad new side, apparently California has strict labeling lawn that makes it difficult to use growlers. As I understand it, you can’t just buy one growler and use it for whatever beer you want. It has to have a label pre-approved by the state that matches the brewer’s brand, beer name, and ABV of the contents. You can’t use a growler from one brewer for another brewer’s beer without obscuring all the original branding. You can find a summary of the rules here: http://www.californiacraftbeer.com/growlers. We supply raw goat milk to our fellow herd shareholders on Salt Spring Island, British Columbia, Canada. We re-use both 4-litre (gallon) jugs, and Avalon 1-litre bottles. For other products (yogurt, feta cheese, etc.) we re-use glass canning jars. More information is on the Community Supported Dairy page on our website. Because selling raw milk is illegal in Canada, herd shareholders must receive the milk they own in person. We will not ship milk, but may be able to meet herd shareholders at the Fulford Harbour ferry terminal.